This is a very large, muscular working dog. The head is rectangular shaped and deeper than it is broad. Males’ heads are generally larger than females’ heads. The skull is somewhat domed. It has a black mask and a rather long muzzle. The black mask should not extend above the eyebrows; the mask can be up to the eyes or above the eyes, but never over the entire head. The large nose is always black with clearly outlined nostrils. The lips should be black, and are usually tight and dry. In males with a very majestic head, slightly loose flews and sometimes slightly open hooks of eyes are often found. Loose flews collect saliva, so some males might drool slightly. The teeth should meet in a scissors or level bite. The medium-sized ears are triangular in shape, fleshy, hanging flat and close to the head. The tips of the ears are level with corners of the mouth. The neck is muscular and strong with no dewlap. The medium to long, water-resistant, double coat comes in lion-yellow, golden to red, red-brown, sand, cream, pale yellow and any combination of those colors, always with a black mask. All colors may have shorter, medium or long black tips on the outer coat. There may be a small stripe or white patch on the chest and some white hairs on the toes. There is always discussion about the amount of white allowed. 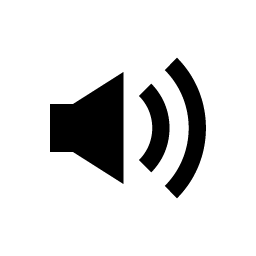 FCI standard states "like the palm of a hand," but it all depends on whose hand you are referring to. 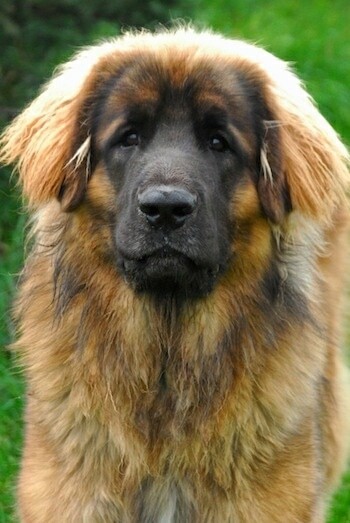 The Leonberger's thick mane creates a lion-like look. The mane in males can take up to 4 years to develop; the mane in a female is less obvious than in a male. Rear dewclaws are sometimes removed. The front and rear legs are feathered. The bushy tail hangs straight down. The pads of the feet are black. They often have webbed feet. This breed does not need a lot of exercise, however, it does need to be taken on a daily walk. While out on the walk the dog must be made to heel beside or behind the person holding the lead, as in a dog's mind the leader leads the way, and that leader needs to be the human. They love to be included in all family outings and are very adaptable to most any environment. They LOVE to swim, hike and be trained to pull carts and sleds. If you plan to have your Leo pull carts or hike, one has to wait until the dog is grown. It is not recommended before the dog is about 18 months old. About 6 to 14 puppies. The size of a Leo's litter tends to vary greatly. They are known for having large litters with the record being a litter of 18 healthy puppies! This breed was established in 1846 in Leonberg, Germany, in the region of Wurttemberg by the German breeder Heinrich Essing from a crossing of the Newfoundland, St. Bernard, and the Great Pyrenees. Heinrich Essing's goal was to create a breed that would closely resemble the look of a lion. 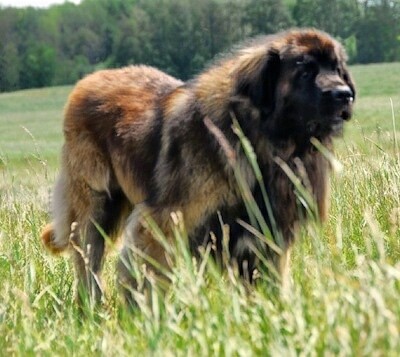 Leonbergers have been owned by many royal families including Napoleon II of France, Empress Elizabeth of Austria, the Prince of Wales, Emperor Napoleon II, Bismarck and Italian King Umberto. 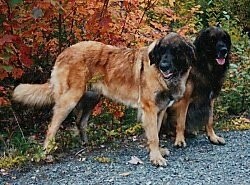 In the nineteenth century many Leonbergers were imported to Russia. Like many breeds, the world wars almost brought it to extinction. By the end of World War II, only a few dogs remained. In 1945, several Germans gathered some of the few remaining Leonbergers and re-established the breed. 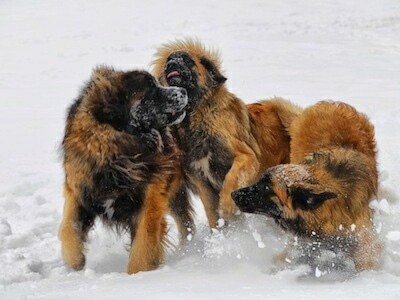 Today the Leonberger has regained his popularity in Europe. The official standard was set in 1949. 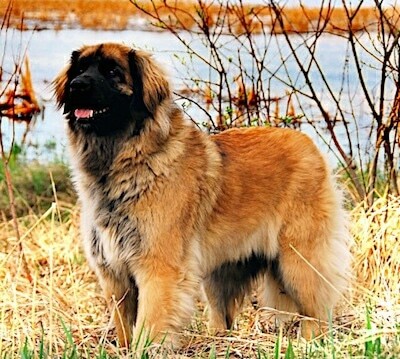 The first Leonberger was imported to the United States in 1971. This versatile breed has been successful for guarding livestock, search and rescue, obedience, water rescue, tracking and as a family companion. 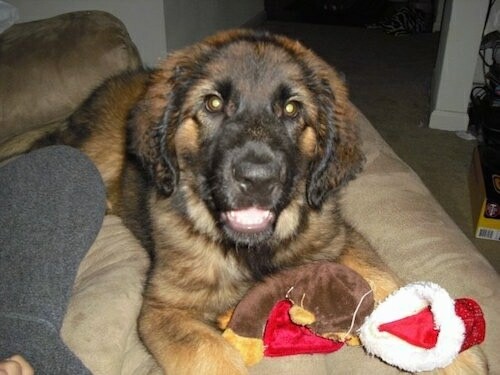 "This is my puppy, Beaudacious, at 5 months old. 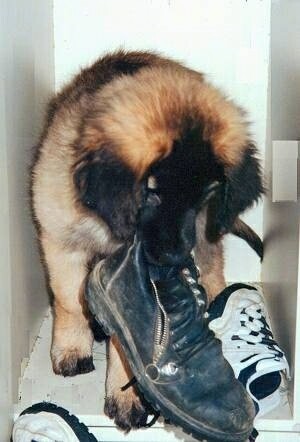 She is a purebred Leonberger. She loves to play tug a war, chew on her kong and spill her water bowl and just lay in it. She LOVES playing in her water. We find her asleep with her head in the water bowl too! She loves to go for walks. She is always so excited to see me even if I just came in from the other room! Beau is an extremely lovable puppy and as clumsy as can be. She is not scared of anything, the vacuum, hair dryer, nothing! She is also very smart and a quick learner. We are very lucky to have such a sweet, gentle loving puppy." 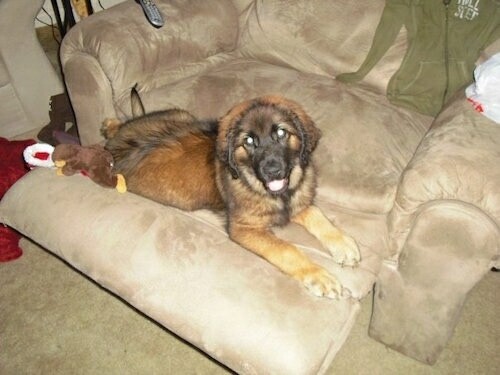 Beaudacious the Leonberger puppy at 5 months old up on the recliner chair.